A Liberal's Libretto: Are young singers unreliable? Or are the fundamentals of opera changing? Are young singers unreliable? Or are the fundamentals of opera changing? Legends Caballe and Horne in rehearsal. It happens more and more. There’s something about this generation of singers, that they are weaker in their bodies or don’t care. I don’t know what it is, but it’s something that is very very frustrating for me personally. I think nobody, not even Tony, came to the core of the problem, and we, as conductors, have to pronounce a very clear “mea culpa” in this. Most singers, especially the young ones, are simply too young, not prepared enough, with technical problems and they get the wrong roles. Take e.g. a good, young soprano who makes a successful debut with, let’s say, Micaela or Liu’. It can work maybe a couple of times, if the orchestras are not too loud, if the director is understanding, if the conductor helpful (not looking for Magda Oliviero’s sounds). Of course, we do need Butterflies and Toscas, but are they the right roles for a young soprano? Definitely not. You can sing them of course, with a fresh voice, but not for long. So they start to cancel – and then they disappear. 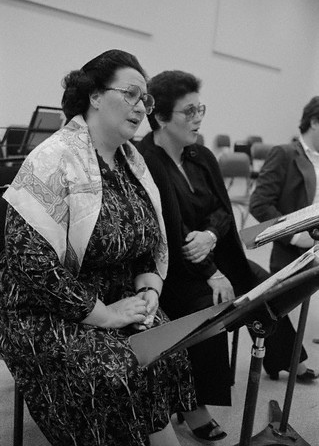 Gruberova never accepted such roles (she sung even Violetta not very often) – and she still sings. If I read that the Nemorino-tenors are approaching Des Grieux (Puccini) or Cavaradossi, of course I am curious, but I already can see… it won’t last long. How many singers, Norman, have we seen “bruciati” by famous conductors? Freni and Butterfly? She was smart enough to do it only once (and, as soon as I know, never on stage), but she had a 40 years long career. Gruberova ditto. Maestro Luisi wasn't the only one to weigh in (so to speak). Two famed mezzo sopranos, Susan Graham and Rosalind Plowright, also had a few things to say on the matter. But, I still don't think the core of the issue has been touched. I think the root is something that I've been harping, gnashing and wailing about since day one of A Liberal's Libretto. You see, we are at a place in opera's history when it appears that the fundamentals of the opera world are changing. Opera is a big art form which requires big orchestras, big voices, big gestures and big personalities. It has always been centered around the voice and around making a sound big enough to cut over the orchestra and to fill a house without amplification. That sound must be healthy and should be cultivated and cared for in a manner that will promote longevity. But, cultivating longevity no longer seems to be the focus. Indeed, opera now seems to be metamorphosing to fit a small, very confining screen - be it the TV or Movie Theater screen. Part of the metamorphosis is the focus on singer's looks as opposed to their voices. We’re singers and we make funny faces, and this is broadcast around the world. I think a lot of my colleagues have done various things to make themselves look better on camera. As the opera world changes, I think it has become taboo to celebrate why opera is different from everything else - instead, we try to make it "mainstream". Opera is *anything* but mainstream. How does Teddy Tahu Rhodes build stamina? Hint: Not by singing. I will make this point though: Even though Maestro Luisi doesn't tackle the full enchilada, he is still quite correct. Companies, (and agents... and conductors) are always looking for a 20 year old to sing, for example, Butterfly or Tosca. In addition, many of the companies who are looking for the 20 year old Butterfly or Tosca, also mandate that she be size 4 or 6. Have these people not figured out yet that it is these young singers who are so consumed with being the size 4-ish, 20 year old, Butterfly that all they eat is a salad with lemon juice and a grilled chicken breast for lunch before a performance. Then, they're out of energy before they even hit the stage. Subsequently, they end up pushing themselves through a show ... and that means pushing their VOICE through the show. After only a short time of that, the voice ... and the immune system ... start to break down. At which point, many current singers simply have vocal surgery to repair the damage and try to go back to work. Not realizing that every time they have another nodule hacked off their vocal-fold, it's making the vocal mechanism a little weaker. Now, I don’t know if it was our seats or the production, but I had a very difficult time hearing. It seemed that many of the singers’ voices were not big enough for Verdi’s Otello. And she's not the first person I heard this from. One friend, who has a season subscription to the Met, and has had for decades, thought he should have his ears checked because he was continually having a harder and harder time hearing singers on the Met stage. Well, he did. And, his ears are fine. To be fair, I don't think the singers, their technique, their travel schedules, their diets or their exercise regimes are the only ones at fault, per Pappano. And, I don't think the opera companies, conductors, agents and directors are the only ones at fault, per Luisi. I think the crux of the issue lies with the current migration away from the fundamentals of what makes opera what it is - what makes opera different and what makes opera grand. I continue to maintain that turning opera into something mainstream ... or normal ... or usual ... or ordinary ... is breaking it down. All in the name of making opera look like everything else we see on TV. Speaking of young singers and TV - check out this little gem. And, I use the word "gem" very loosely. The job of Met Opera general manager is as iconic in its way as mayor of New York or manager of the Yankees. By any standard, Peter Gelb, now well into his seventh season, has established his tenure as among the most significant in the Met’s 130-year history. Giulio Gatti-Casazza saw the company through the stock-market crash and the depths of the Great Depression. Rudolf Bing delivered it to its new home at Lincoln Center. Gelb has guided the opera company into the digital age and has put an art form long associated with aristocratic privilege on a more populist footing. Annual new productions at the Met have nearly doubled; geriatric demographic trends have been arrested, if not reversed; fund-raising is setting records. The Met now has a 24-hour channel on SiriusXM radio; an iPad app; education programs in more than 150 schools in 21 states; subsidized tickets; free dress rehearsals. When Gelb became general manager in 2006, the number of subscribers surged and the percentage of sold-out shows rebounded off historic lows. Subscriptions and the percentage of house seats sold have tailed off in the past few years, and the Met recently had to roll back last season’s 10 percent ticket-price increase, but these negative box-office trends have been offset by the growth of the audience for the Met’s “Live in HD” broadcasts, which Gelb initiated and which last season drew 2,547,243 viewers in 54 countries. “Peter’s record of achievement and ambition is unparalleled — I think he’s saved the Met from brontosaurusdom, and I say that as someone who has been going to opera since 1958,” says André Bishop, who as artistic director of Lincoln Center Theater has joined Gelb in establishing a commissioning program for new operas and musical-theater pieces. Can this operatic climate change last? And if it does, will the young singers of today possess the longevity that is needed to build the next generation of operatic legends? Is building longevity in the next generation of singers even a priority? I mean: once a singer gets past a certain age, will they -like in Hollywood- be passed over for roles that are then given to the younger, more attractive singers? [SIGH] It certainly seems like we are headed down that road. And some would say we are already there. That video is unbelievably scary.